At COMPARITY we compare home and other insurance side by side to help consumers understand options, find the right policy for the best price, and ultimately connect with the agency that will service the policy. It’s a free, private service that we offer not only to consumers but also mortgage bankers and real estate professionals as a way to help their clients get into a new home more smoothly. You might recognize COMPARITY as something like Progressive’s “the other guys” comparison ads. We’re similar in that we provide side-by-side comparisons from multiple carriers quickly, conveniently online. But that’s where the similarities likely end. COMPARITY is different and better in five key ways. We compare homeowners policies and no one else does. Sure, you’ll find other home quote sites out there but before you go to them you’ll want to know about difference #2. 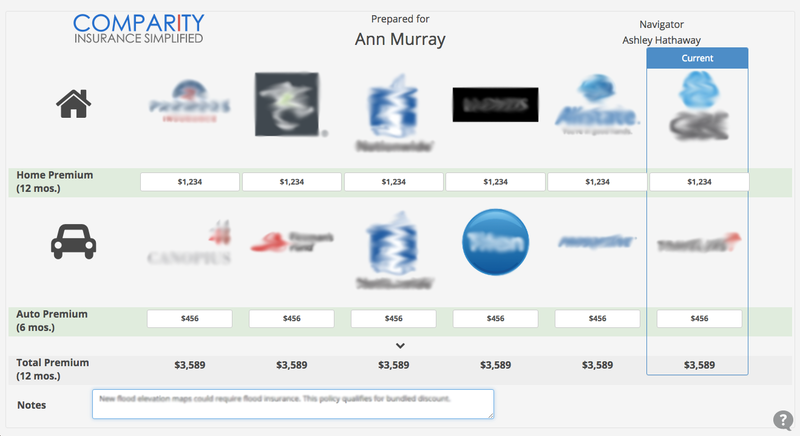 COMPARITY delivers underwritten policies that are ready to purchase the moment you get a quote. Everyone else offering comparisons is showing rough estimates just to get contact information quickly. They do that so they can sell their own product or, worse, sell the contact info. The reason everyone else will show their competition’s price is because they know that no one buys insurance without talking to someone and they want to be the first ones talking directly to consumers. They won’t be the only ones fighting for that attention, though. That’s difference number three. COMPARITY is the only company that quotes both independent and “captive” brand carriers. Captives are typically the companies you see on TV all the time. They don’t allow their agents to represent any other carrier. Independent agencies can offer consumers multiple options but they can’t ever offer the captives. COMPARITY offers both. The reason we can is because we don’t work for the carriers. We help insurance shoppers and insurance agencies come together through our unique process that treats both sides fairly. That’s why we conclude with..
COMPARITY provides those same great comparison features consumers really like plus on-demand support from a licensed, unbiased insurance expert that everyone truly needs. We call them COMPARITY Navigators. Our Navigators are unbiased because they’re compensated in the same way no matter who gets the business. Navigators’ only job is to help consumers understand options, make a choice, and connect with the agency that will service their policy. Our Navigators are there to explain the difference between wind/hail vs. hurricane deductibles and to let consumers know, for example, that a 2% deductible means 2% of the value of your home, not 2% of the damage! Did you know that? There are a lot more benefits to using COMPARITY. The best way to learn about them is to experience The COMPARITY Difference. COMPARITY: we’re here to improve the way people buy and sell insurance so everyone wins.